By selecting General Motors, Unifor has sent a signal – a very clear signal – that it intends to tackle its toughest hurdle first. Unifor has made it clear it will not sign a new labor contract with GM until it secures additional investment and product development at the Oshawa Assembly. The Detroit Free Press reports Unifor will still come to the table with investment and new product as part of the deal or it’s no dice with GM. The Canadian union has also authorized a strike should it become necessary. “We are not under any circumstances going to sign a contract with GM unless there is a firm commitment at St. Catharines and Oshawa,” Jerry Dias, Unifor President, said at a news conference. GM has remained firm on its negotiating stance. The automaker has repeatedly reiterated it will not discuss new product and investment at the Oshawa Assembly until a new labor contract is inked. “At GM Canada we remain focused on working with Unifor to reach a mutually beneficial and competitive new agreement,” the automaker said in a statement. Dias went on to state the strategy is proven to work. Unifor used a similar hard line in 2012 when it chose Ford as its target automaker. Ford has since hired 2,200 new workers. 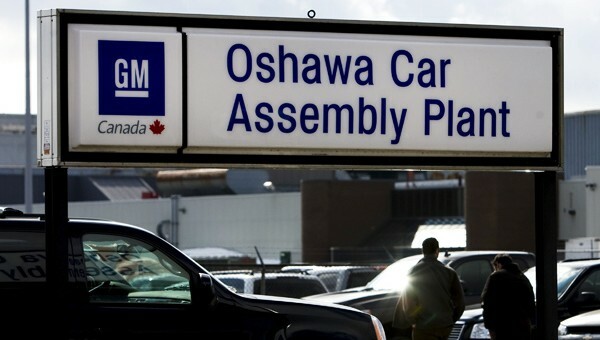 GM’s Oshawa Assembly currently employs 2,600 workers and assembles the Chevrolet Impala, Buick Regal and Cadillac XTS on the Flex Line. All three are slated to relocated to new assemblies, which has led workers to become frightened for their futures. The union’s current contract expires on September 19, 2016. This is a big game of chicken. Both sides say “give me what I want or I close the plant down.” The scary part for the workers is that one side has the power to end the game permanently. Should Queen Mary decide the upside to making cars in Oshawa doesn’t outweigh the downside, Oshawa is history. The workers know this, not so sure UNIFOR know this. If the union bargains a competitive contract, Oshawa has a better than even chance of winning new product, but if Dias holds a gun to GM’s head, strike or new product, it will be a very long strike and the place will be closed in 3 years. Guaranteed.